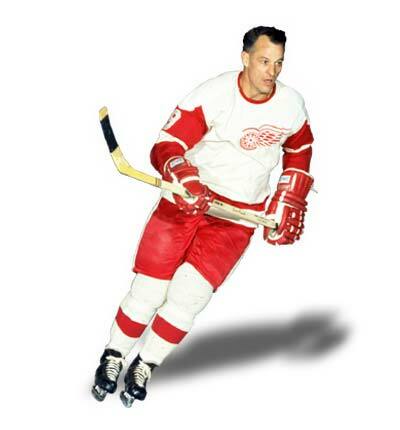 Gordie "Mr. Hockey" Howe was born on March 31, 1928 in Floral, Saskatchewan, Canada. Howe did not play organized hockey till he was eight, but quickly picked up the game. He exercised relentlessly and gained a powerful physique working construction with his father during the summers. Howe was signed by the Detroit Red Wings when he was 16 and moved through the Red Wings Galt, Ontario junior team, to the Omaha Knights of the USHL and finally to the Detroit Red Wings. Howe was soon teamed up with Ted Lindsay and Sid Abel in what would be called the "Production Line", one of the all-time great NHL combinations. Howe played 33 pro seasons, one has a 17 year old with Omaha of the United States Hockey League, 25 years with the Detroit Red Wings of the NHL, six with the Houston Aeros and New England Whalers of the World Hockey Association, one season with the Hartford Whalers of the NHL and one game in 1997-98 with the Detroit Vipers of the IHL. Godie Howe set numerous hockey records that seemed unbreakable at the time. He was an effortless skater with deceptive speed, tremendous streght and a powerful shot. In his fourth NHL season, 1949-50, Howe began one of hockey's most amazing streaks. The the next 22 years, Howe scored over 20 goals a year. The Red Wings and Howe won the Stanley Cup in 1950 and the following year Howe was atop the league scoring, a feat he would repeat for the next three years. He would go on to win a total of six Art Ross trophies and also added six Hart Memrial Trophies as the league MVP. As 41 year old in 1968-69, he scored 44 goals and added 59 assists for a career high 103 points. At 43, Howe retired from the Red Wings in 1971 after injuries slowed him down. He was inducted into the Hockey Hall of Fame immediately. Two years after his retirement, Gordie Howe could not resist the opportunity of playing with his sons as he signed along with Marty and Mark Howe with the Houston Aeros of the World Hockey Association. He was an instant success in the WHA and tallyed 508 points in 419 WHA games. In 1979 he returned to the NHL with the Hartford Whalers when they moved from the WHA to the NHL. Howe played that season as a 51 year old, appearing in all 80 games and collecting 41 points. He made his final professional hockey appearance with the Detroit Vipers in 1997, making him the only player to have played in 6 different decades.